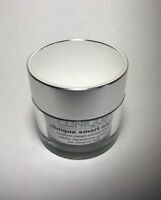 Clinique Smart Night Custom-Repair Moisturizer Dry Combination Full Size 1.7 oz. I have been using this product for quite some time. It has good coverage without looking like a heavy foundation, It also looks somewhat moist which is good for older skin. Only drawback is that it requires some really good soap and scrubbing to get it off your hands so it does not show on a white towel. I love this product. I use it everyday. I believe there is only one shade and it's perfect. 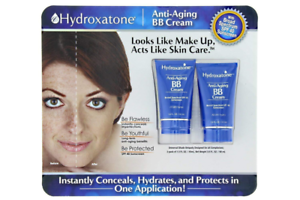 I use moisturizer first then Hydroxotone BB cream. Great covering. Goes on smoothly. It's got a good SPF for sun protection as well. 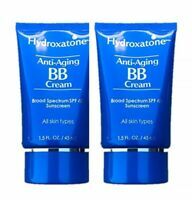 Starting using Hydroxatone Anti-Aging BB as part of an effort to take better care of my skin. Love it and do not use anything over the top. Good, clean coverage and feels good on my skin. My skin is very difficult to match. I searched for years for a foundation that I liked. I absolutely love this product. It goes on the light and does not feel like I'm wearing make up. It was also good for your skin while you are wearing it unlike other foundations. This foundation works great as a foundation and sunscreen. Applies very nicely with just a hint of color. My skin is very sensitive and this product does not cause any irritation or breakouts. Love it.